Following on from a plethora of recent proposals in Woolwich is another tower. 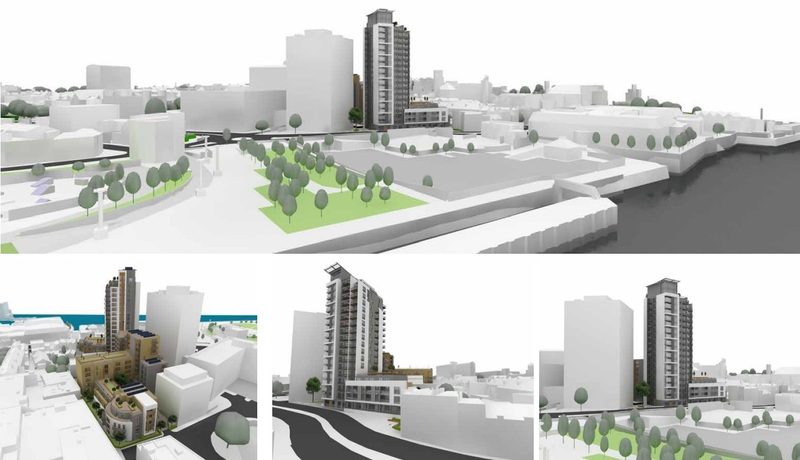 The scheme is on the Callis Yard site, with the tower located opposite Waterfront leisure centre. It would be positioned opposite other tall buildings planned as part of Berkeley Homes Royal Arsenal masterplan, and alongside Riverside House. Inland Homes are behind the scheme. The proposals are on the poor side and seem to be squeezing a lot into a tight plot. The tower itself is a bit of a mish-mash of various materials. Mainly grey brick and grey cladding. It’s not going to win any awards. Just as well it will be surrounded on pretty much all sides by other tall buildings. This is though a step down in quality from some of the Berkeley Homes development over the road. It has the whiff of the type of cheap building which was all too common 10 years ago. The plan comprises of 97 sq metres of Leisure (opposite a large leisure centre? ), 361 sq metres of nursery space and 160 new homes. It follows on from an aborted scheme given permission in 2008 which was of a lower height. Inland Homes do not have a great track record of building quality buildings. Their site shows rather too many poor quality developments, built in a dated mid ’90s style. The architects they have commissioned for the Woolwich scheme are Metropolis PD. They have the dubious honour of being the architects behind the design (below) which would have replaced the Georgian terrace (above) opposite Kings Cross station. The proposals were to replace them with a glass box. A really banal glass box. Fortunately planning was refused and renovation is now ongoing. The Woolwich tower will be surrounded on almost all sides, which is a blessing, as its weak design will not be such a big issue. The 160 flats and their occupants will bring some life back to that part of Woolwich. Berkeley Homes also plan a number of tall buildings just over the road. The proposed scheme is shown below outlined in red. The Waterfront leisure centre will be increasingly surrounded by tall buildings in coming years. This just adds one more to the many already planned. 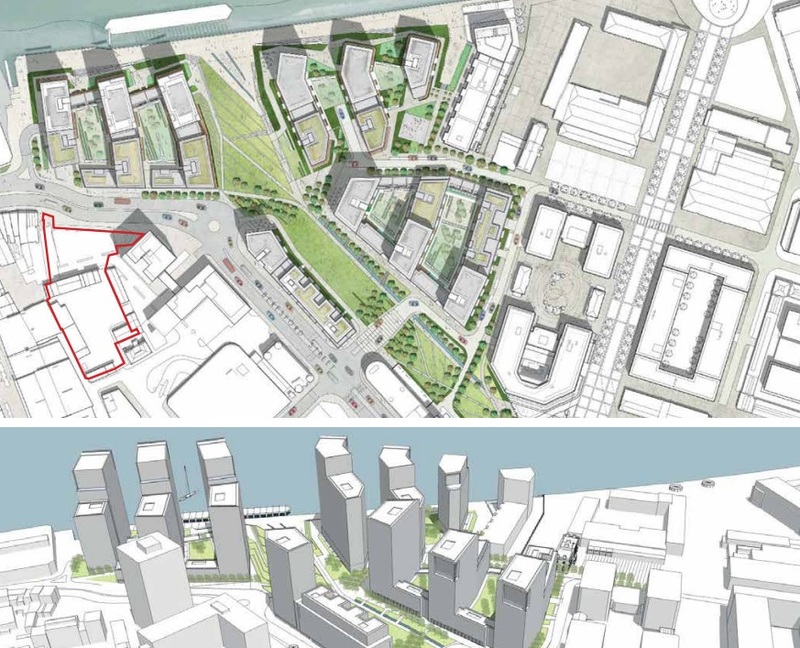 It is earmarked for possible change of use in the Woolwich masterplan and is in a prime riverside site. I suspect it wont be around in its present location for too many more years after Crossrail opens and the ferry is relocated. 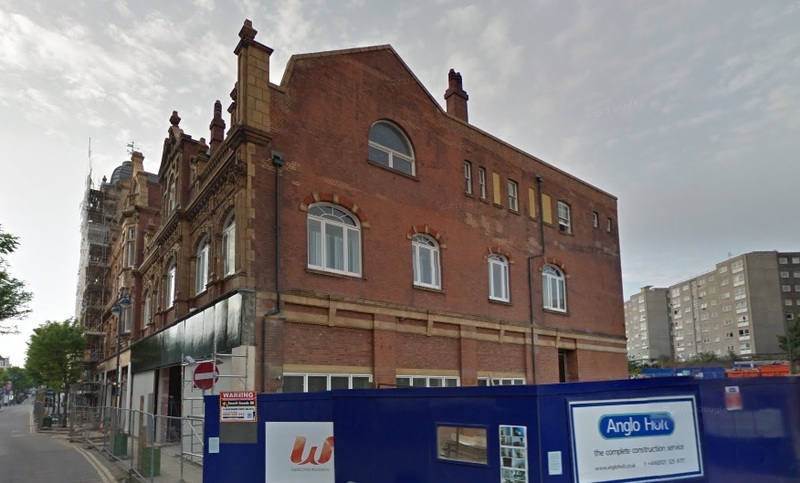 Also in Woolwich, the Antic pub group have applied for planning permission for a new pub below the Travelodge. That would bring a pub to this neglected corner of Woolwich, close to where the tower is proposed. Antic run many well liked pubs across London and have recently opened the Post Office in Eltham. 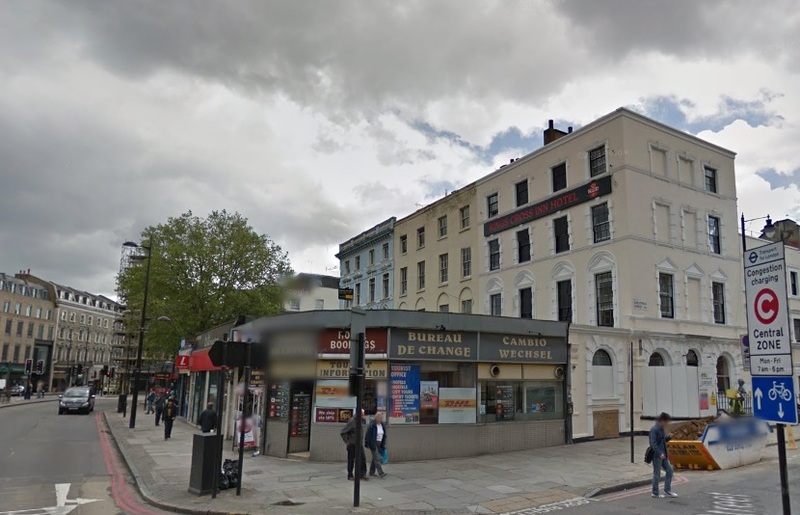 They are also planning to open a new pub in the former Woolwich building society HQ at General Gorden Square. The goal is to open by the end of March. In addition there will be another pub close to the Dial Arch in the Arsenal. That will be operated by the Geronimo group. What’s happened to the cinema we were promised? And the waterfront cafes and restaurants? Will there be bridge, or tunnel linking the arsenal to the rest of Woolwich? Or it will feel like a gated community. Why is there no access road from the town centre, or a bus route? Without a heart or soul.